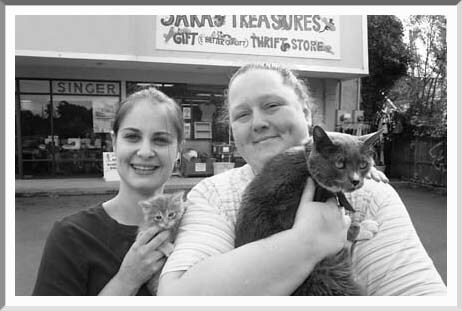 Cat lovers Nicole West and Melinda McCormick pose with clients Oliver and Scooter in front of SARA's Treasures, the store they manage at 871 River Road. SARA stands for Shelter Animal Resource Alliance, and the store is a combination thrift shop and cat-adoption agency, founded in 2001 by Diane Robertson, who previously worked at the East Maui Animal Refuge. "I saw the need for a group to help rescue and find homes for adoptable animals," she says. Since '01, a total of 458 cats and 913 dogs have been rescued from animal control shelters. (Dogs are driven to Portland for adoption.) McCormick began as a SARA volunteer in '02, then stepped in a year later when the manager abruptly left. "I said I'd help for three months," she says. "I'm still here! It's very fulfilling." West, who moved from Virginia with her husband and three cats in '03, also began as a volunteer before hiring on as cat-rescue coordinator in July of '04. "We've rescued 340 cats since then," she notes. "But cats are still being euthanized every day, all because people don't spay and neuter." SARA's always needs donations and volunteers. Drop in to get your kitty fix.